We recently travelled across the world from the UK to Raja Ampat in West Papua, Indonesia to dive some of the best dive destinations in the world. It was a long trip and quite costly as we stayed in resorts and dived every day. 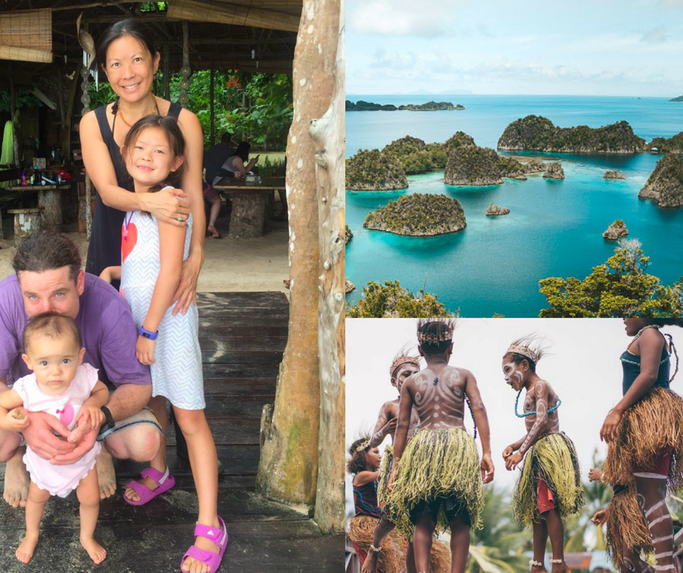 So we wanted to find out how to do Raja Ampat on a budget AND with kids in tow. Traveling with young children can be daunting. How about adding scuba diving to that and also somewhere remote like Raja Ampat? How do you even organise a scuba holiday there with kids? Is it expensive? Safe? Vaccinations required? What do you even pack for family of 4 including dive equipment, 7 and 1 year old daughters? How do you deal with budget planes and long stop overs? Screaming kids? Girls that Scuba member Michelle-Ann used to be a dive instructor living in Dahab, Egypt with a daughter operating a small dive business. Since returning to Melbourne, Australia and having another child, diving had always been on her mind but not been viable. When she finally got the chance to dive and travel again her and her family decided on Raja Ampat to dive the untouched reefs and support the local papuan community staying in an eco-lodge. Air Asia has some great offers from Melbourne to Bali however we decided to fly with Garuda airlines as they gave us the flexibility of luggage, meals and the convenience of having great seats without paying extra. Automatically we got the seats where there was a baby cot available and extra leg room). Then it was onto Denpensar-Makassar-Sorong and then ferry to Waisai. Layover in Makassar was around 9 hours but they have the Ibis airport hotel where we could rest for a few hours. Ferry to Waisai was 2 and a half hours. For more detailed information on how to get to Raja Ampat check out this article. Travel light! We only had two carry on suitcases and my dive bag. This was heavy but it held two sets of equipment. As a petite person nothing rental usually fits so I bring my own. Saying that.... next trip I will downsize further and only bring masks, snorkels, fins and dive computers. Renting dive equipment is not too expensive and snorkeling with kids is a must to explore the aquatic life. When snorkeling with my older daughter, her having fins was beneficial when dealing with surface currents. Check out our guide to women's scuba equipment here for some recommendations! We didn't bring any toiletries as I knew we could buy everything at the local Indonesian chemist for a fraction of the price in the western world. 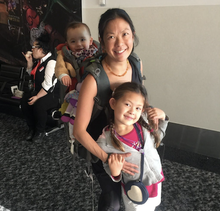 Another essential piece of luggage was our Macpac baby carrier which was invaluable as it was comfortable for my back when hiking and walking in villages. It also had a huge compartment below to store water, nappies, small medical kit and other essential items. Also for our baby, she was comfortable, could sleep and didn't sweat. We didn't bother with a stroller as we were off the beaten track and also in Bali the roads aren't the best. As Raja Ampat is remote, its recommended to bring a medical kit fitted out with antibiotics and other essentials for off grid traveling. This was essential as the closest pediatric doctor is in Sorong and luckily we did as our daughter got an infected leg and we had to use antibiotics to treat it. We stayed at Papuarts Alter Native eco lodge ($80 a night) run by Belgium Timon and Papuan wife Helga. This fitted our needs for having a babysitter while diving. Helga has an extended family and they were able to entertain our kids while we dived three dives a day. We stayed in a lovely bungalow which has our own bathroom and an upstairs treehouse with double bed for the kids. For more accommodation on Raja Ampat check here. We dived with Scuba Republic. As we were a group of 5 divers we had our own little daily boat and requested that we finished earlier to be back for the kids. Usually from 8-3. Saying that we were able to make 3 dives for up to an hour and experience a relatively untouched and diverse eco system where over two-thirds of the worlds species inhabit! Prices start at $1609 for 6 nights on a liveaboard. See more options here. As our baby was over one years and starting to walk plus eating everything off the floor I got her Hepatitis A vaccinations as well as gave her preventative homeopathic thyphoid medication before we left Australia. Better to be safe then sorry and even though where we travelled was relatively clean.... at the end of the day we were in the jungle. 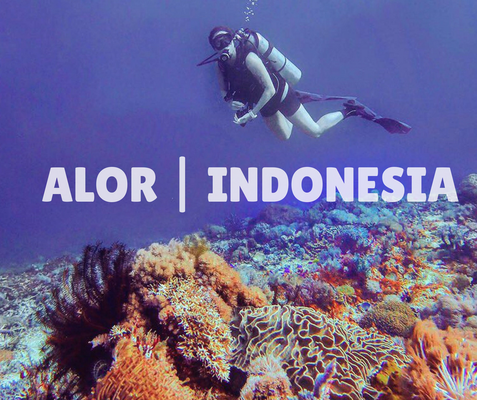 After this experience, diving and traveling remotely in Indonesia is very doable but it's important to take into account the long travelling hours and days to recover. A DVD player is a must as wifi is not available in remote places. This was crucial to allow the children to rest and unwind in between stops. Also take into account lack of sleep and being in a new environment. Kids are very adaptable and Indonesians love children so there is no issue with baby sitting services. Also we customized our diving holiday to take this into account. We made sure we had days to spend quality time with the kids, allow them to live and enjoy the local communities.It is more expensive but for the sanity of both parents and kids it's important to allow a lot of down time. Do you travel and dive with your kids? Let us know your tips below! Michelle-Ann is a current PADI OWSI and former dive business operator from Dahab, EGYPT with two young kids. She is now back in Melbourne and besides teaching First Aid for St John, a swimming teacher, and also run a small tour operation catering for divers who want to go to Indonesia.